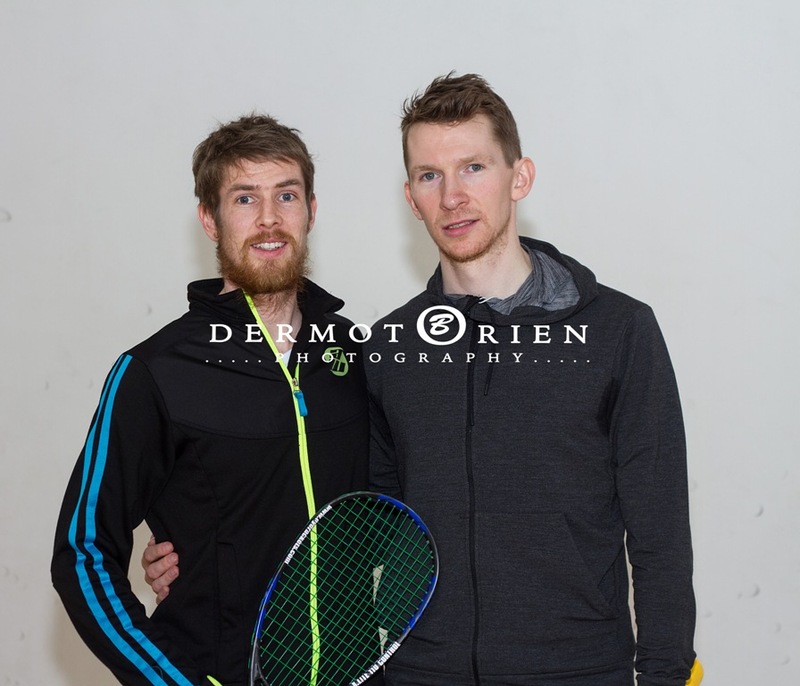 This year brought a unique pairing to the Irish Squash National Championships with both finalists in the Men’s A section being from Carlow. Brian Byrne and Arthur Gaskin, childhood friends grew up playing the Junior Squash circuit and are now both playing on the professional circuit. A huge crowd filled the show court of Fitzwilliam LTC this weekend for one of the most eagerly awaited finals in recent years and Arthur Gaskin confirmed his dominance of the Irish Senior Squash scene with an emphatic 3/0 win over Brian Byrne. Gaskin was in tremendous form, his years of experience on the pro circuit were very evident. In the first two games Arthur played just 3 balls down, he was patient and continually looked to move Brian around the court, Brian had played an 2 hour epic semi-final match the previous night and was feeling the effects and as the match wore on this became more evident. Arthur took the first 11-6 and followed this up with an 11-4 win the second.. As Brian’s error count began to rise so did Gaskins, however Arthur went on to take the 3rd and final game 11-8. This was Arthur’s 7th Irish National Final and his 4th win and it was well deserved. Credit must go to both players who played a tremendous sporting game full it was full of courage, commitment, skill and no doubt we will see these two fine players battle out many more finals like this. In the Ladies A Ciara Moloney had a tough semi- final playing Hannah Craig from Belfast No 3 seed, this was a tight match throughout which Hannah eventully won. In her final match Ciara played Sophie O’Rourke with a loss of 0/3, finishing in 4th place. Claire O’Neill finished 6th and considering her long absence away from the courts she can be pleased with her overall finish. Another of the great battlers Niamh Brennan had a terrific game with Dubliner Niamh Maher and Brennan was 2/0 but lost 3/2. Willie Hosey is used to winning senior titles and he has 10 to his name, this year at the last minute he decided to play the over 40’s and reached the final where David Ayerst from Belfast denied Hosey another title. Hosey took the first but found the matches from Friday and Saturday took their toll and he lost 3/1. Sam Olwill gave us a glimpse of his wonderful talent with a terrific display in the Mens section with a 14th place finish losing out to Conor O’Shea. Carlow squash players really made a huge impact on this years Senior Nationals, it was the first year that they all could come together for the event and they really left their mark on the championships. All playing squash from a young age these players found the love and passion for the game and hopefully they will have many more years playing and enjoying their chosen sport. The next event will be the 20th Carlow Junior Squash event (March 13/14th) and this year there will be a ‘Renunion’ event running concurrently with the CJO. Any player who previously played is invited to take part in the ’Renunion’ and it’s sure to be great fun.